Happy Monday Team Stryker fans and if you have the day off today happy Remembrance Day. Without those brave soldiers that protect us all daily I would have no inspiration for the heroics that Eagleheart, Deadeye, Casanova and V-Scope display within the pages of Team Stryker. While there are so many depictions of war told through movies, books, comics and video games it can sometimes be hard to remember that there are real people out there risking their lives on a daily basis to keep all of us safe. Team Stryker might consist of super soldiers but they are not nearly as brave as the men and women that make it possible that I can live my dream of sharing TS with all of you. On a less serious (but totally awesome) note, I’m thrilled to present you with the newest page of Team Stryker! Deadeye is a man of few words and only ignites in the heat of a life or death struggle, preferably with a dangerous animal twice his size. Deadeye doesn’t have a life outside combat and is in a constant state of survival which makes for someone you want in your corner when an evil villain unleashes a velociraptor on you. 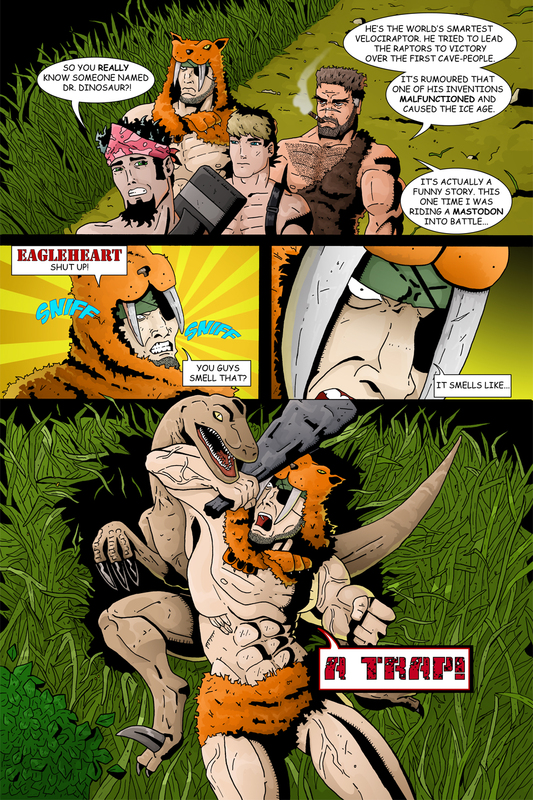 Check back on Thursday to see if Deadeye and the rest of Team Stryker survive their encounter with one of the most dangerous dinosaurs to ever walk the earth!